Candidates can get complete information about WBSETCL Assistant Engineer Hall Ticket 2019 from this article. 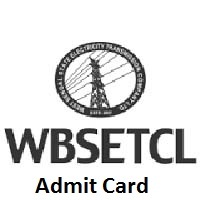 The higher officials of the West Bengal State Electricity Transmission Company Limited (WBSETCL) had not yet released the exact AE examination date and Admit Card release date. They will notify the exact dates sooner. All eligible candidates who are waiting to download the WBSETCL Assistant Engineer Admit Card can refer link which is given at end of this page. Candidates who are trying to download the WBSETCL AE Hall Ticket can go through this article. For the comfort of the competitors, we had given the steps for downloading the WBSETCL AE Admit Card 2019 in the last section of this page. Candidate can check over the following sections to know about the Information present on wbsetcl.in Call Letter 2019, selection process and steps to download the admit card. You can download the WBSETCL AE Admit Card 2019 only from the official site that is wbsetcl.in. If the information provided in the following sections is not accurate, the candidate can inform us then we will bring it to the recognization of the higher authorities. They may rectify it and provide the correct information then we will update that data in this page. Aspirants who had applied for WBSETCL Recruitment 2019 have to clear the rounds present in the recruitment process. The higher authorities of West Bengal State Electricity Transmission Company Limited (WBSETCL) had clearly said that the candidates who had qualified in two rounds that are Written Test and Personal Interview will be only taken for 465 Assistant Engineer, Linesman, and Other Posts. Others will not be recruited. Initially, applied candidates must visit the official site of West Bengal State Electricity Transmission Company Limited (WBSETCL) @ wbsetcl.in. From there you will get the home screen of WBSETCL. Now in that home page search for the WBSETCL Assistant Engineer Hall Ticket link. After identifying the link click on it. Then fill the details present in it. Recheck all information given is correct or not then hit on the submit button. There you will get the WBSETCL AE Admit Card 2019 on the new page. Download that wbsetcl.in Call Letter 2019 in the given format. Take two or more copies of the WBSETCL AE Hall Ticket and carry it while appearing to the exam. Hope that the information about WBSETCL AE Hall Ticket is useful for the aspirants appearing for the examination. The exact examination dates are not yet announced by the officials of West Bengal State Electricity Transmission Company Limited (WBSETCL). You can visit our website @ freshersnow.com for any further updates. Stay tuned to our page for the updated details regarding the WBSETCL Assistant Engineer Examination.